Open wounds are a particularly acute problem, especially among the elderly. PlasmaDerm, a new medical technology solution, uses plasma to facilitate faster healing of wounds. 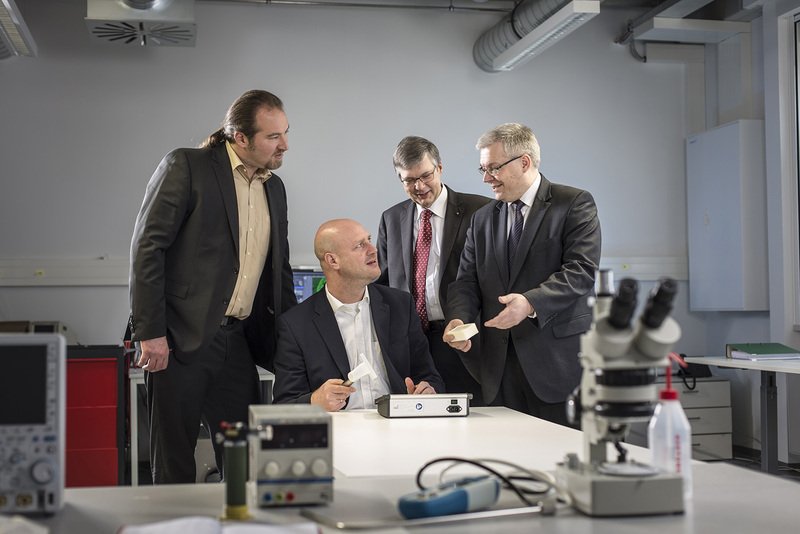 From left to right: Dr. Andreas Helmke, Dr. Dirk Wandke (Cinogy GmbH), Prof. Wolfgang Viöl and Prof. Steffen Emmert (University Medical Center Göttingen) developed the PlasmaDerm medical technology solution that makes wounds heal faster. Skin disorders are a common problem in this part of the world. Atopic dermatitis, psoriasis and chronic venous leg ulcers – typically caused by diabetes or varicose veins – can cause patients years of suffering. Working in collaboration with the company Cinogy and the Department of Dermatology, Venereology and Allergology at the University Medical Center Göttingen, the Fraunhofer Institute for Surface Engineering and Thin Films IST has successfully developed a new medical technology solution for treating wounds and skin disorders known as “PlasmaDerm”. 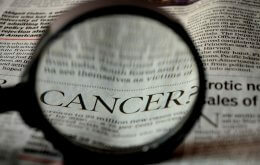 Plasma promotes wound healing when it is generated directly on the skin. “All you feel is a slight tingling sensation,” says Prof. Wolfgang Viöl from Fraunhofer IST, moving a device approximately the size and shape of a pocket flashlight in small circles over the back of his hand. Holding the device just over the skin, a faint purple mist can just barely be seen at the device’s tip. That’s plasma, he explains – an ionized gas. PlasmaDerm – which was developed by a team consisting of medical professionals, biologists, physicists and engineers – is a novel solution. For the first time, the device generates a non-thermal or “cold” plasma directly on the skin at atmospheric pressure. The patented method involves placing the electrode of the device close to the skin, with the skin itself acting as the second electrode. A high voltage is then applied across the gap, and the resulting electric fields convert the area between the electrode and the skin into non-thermal plasma. Since cold plasma has not been used on human beings before, the top priority of the Fraunhofer IST was to evaluate the safety of the solution. “We carried out a risk-benefit analysis to evaluate all the chemical and physical parameters and concluded that there is no reason to be concerned about using plasma on people,” says Dr. Andreas Helmke, describing how Fraunhofer IST went about the process. A clinical study conducted by Prof. Steffen Emmert at the Department of Dermatology, Venereology and Allergology at the University Medical Center Göttingen revealed an antiseptic effect and improved wound healing. But Prof. Emmert explains that the greatest benefit of the application is the fact that “non-thermal plasma actually combines the mechanisms of different therapies. UV, ozone and electrotherapy are already available, but plasma achieves a better effect in a shorter period of time.” Plasma reduces the bacteria count on the skin’s surface, while the electric field simultaneously boosts the skin’s microcirculation by allowing more oxygen to be delivered. These are both decisive factors in improving wound healing. To enable the new method to be applied more flexibly, the researchers needed to develop a portable device. To do this, the Fraunhofer IST worked together with the company Cinogy. “We had to develop a device that was small but capable of generating high voltages. The result is only about the size of a laptop and can be plugged into a normal socket between 100 and 230 V,” says Dr. Dirk Wandke, managing director of Cinogy, describing how they tackled the project’s biggest challenge. PlasmaDerm is now available all over Europe. Prof. Wolfgang Viöl, Dr. Andreas Helmke, Prof. Steffen Emmert and Dr. Dirk Wandke jointly accepted a Fraunhofer Prize in the Human-Centered Technology category for their development of PlasmaDerm.